mipsterz: what’s wrong with muslims being hipsters? So, the internet exploded recently with debate about a certain video – the ‘Mipsterz’ video. ‘Mipsterz’, or ‘Muslim Hipsters’ are a group/collective of American Muslims who also identify as hipsters. 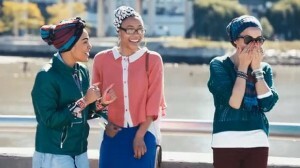 The video features a group of Muslim women wearing their hijabs in unconventional ways and styled in the cutting edge of fashion, dancing, skateboarding, fencing and generally being cool, set to the soundtrack of Jay Z’s ‘somewhereinamerica’. Unsurprisingly, the video was faced with immediate backlash from the Muslim community, who felt that not only did it not ‘make a point’, but that it was suggesting that to be accepted, Muslim women must conform to Western ideals and notions of what is ‘normal’ or ‘cool’. There was also some more silly criticisms which I won’t bother to go into here, such as that the women who were featured were almost all models (because models can’t be Muslims? ), that the video was largely produced by men (but still featured women who have the agency to direct their decisions, so not sure why this immediately means exploitation), or that the hijabs featured were not ‘modest enough’ (bleugh). As someone who was raised a Muslim in the western context of Australia, watching this video evoked a whole range of emotions for me. When I was growing up, I felt deeply disoriented by what I perceived to be the disconnect between creativity and alternative culture, and the Islamic traditions that I was raised with. Going through high school, with a growing interest in indie music, art, literature, and alternative fashion, I felt like I had to make a choice – it was either alternative culture or my faith. I chose alternative culture. I stepped away from my faith, and denounced Islam, and it’s something I now deal with every day. If 15-year-old Zoya could have watched a video like this, would her choice have been different? If I could have seen a (yes, slightly superficial, sugar-coated) vision of young Muslim women embracing their religion and not being excluded from the aspects of western culture that most appealed to me, would I have tried harder to blend the two influences in my life? Could I have had it all? The backlash against the Mipsterz video, unfortunately, seems to indicate ‘no’. Reading the numerous critical comments about the women featured in the video, a large portion of which shame them for not wearing their hijabs in the traditional sense, or for being too ‘western’, makes me realise that a significant amount of opposition still exists against the performance or ownership of western culture by young Muslim women. To me, the Mipsterz video was not suggesting that all American Muslims are ‘just like everyone else’, but that there are different pockets of Muslim culture, which can be diverse and linked to western subcultures, and that that’s ok. The biggest criticism of the Mipsterz video is that it doesn’t make a ‘point’. What does ‘somewhere in America’ even mean? Why are these women trying to appease the western gaze by downplaying their differences instead of embracing them? To me, this criticism just proves the utter lack of conversation that exists about young Muslims in western countries. Reconciling cultural traditions and religion with western culture is incredibly difficult and fraught with tension for migrants, and is an area that is largely untouched in public debate. Mipsterz should not be responsible for making the ultimate statement about young Muslims, or Muslim women. The video is offering one view of Muslim culture, not a determining view of all Muslim culture in America. By claiming that the video is attempting to appease western assumptions about Islam is to deny the participants of the video the right to perform their mixed cultural identity how they choose. It would be like telling me that by wearing skinny jeans and enjoying listening to HAIM, I am somehow trying to negate my cultural identity as an Indian woman – that I couldn’t possibly really just enjoy what I wear or watch or listen to, but that it’s a misguided attempt to ‘fit in’. Muslim women living in western countries face an uphill battle of cultural acceptance from both sides of the fence. The Mipsterz video tells us that not all Muslims need to subscribe to the same ideals of either Islam or American culture. Well-written and thought provoking, you could even go further. I want to know more about how you foresee the future of Western Muslim women and the seemingly polarizing sides of traditional vs modern expressions of Islam. Hi Rachel – glad you enjoyed the piece. I guess I hope that as the generations who grew up in western countries begin having children, more of a cross-cultural exchange can take place. But I know that for me, I found balancing the expectations of my parents and my own wishes and goals to be too hard to reconcile – I don’t actually speak to my family any more, which is a shame. I hope that’s not the case for others in similar situations! Totally agree with Rachel: very well written and thought provoking! I also feel the video portrayed another pocket of cultural identity rather than a downplay of difference. Why can’t this be a ‘difference’ worth embracing? It’s great to hear your personal insights and reflections on this, Zoya. Like you say, there isn’t much public discussion around this. What a relatable article.I honestly am going through this phase right now. I want to wear the hijab but like this. I feel it would do me good, but i am such a outspoken person…. decisions…. This entry was posted in Culture, Featured, Feminism, Life, Opinion, World and tagged Culture, hipsters, mipsterz, muslims, religion, video. Bookmark the permalink.